Postcard mailed to Rev. R.B. Layton in Kentville, Nova Scotia, from his mother Margaret Layton in Oakfield, N.S. Mailed from Halifax. The two one-cent postage stamps have printed on them: "War Tax." This Gothic revival building was completed in 1912. 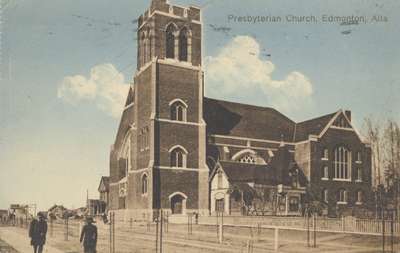 Now known as First Presbyterian Church. Hope the children are better. Adrianna leaves tonight for Hx., sails Saint John this week. No word from Rick. Anne got a Xmas box from him today, sent 19th Nov. Let us hear from you. Happy New Year to you all.